Cheek augmentation is a cosmetic procedurue in which flat saggy cheeks are enhanced in different ways to give a fuller and defined look. The cosmetic surgeon can insert implants over the cheekbones, inject tissue fillers into the cheeks, perform a simple fat grafting or make changes by shaping up the zygomatic bones manually. All these help in restoring the volume as well as chubbiness of those parts of the face, thereby resulting into sculpted and youthful cheeks. The entire procedure of cheek augmentation may take anywhere between half an hour to two hours depending upon the type of enhancing technique. Implants – In this method, snug pockets are made right over the cheekbones in order to position solid silicone implants inside them. Even though it does not offer a completely natural look, the effects you get are permanent. Fillers / Injectables – This is a non-invasive process in which hyaluronic acid injectibles, such as Juvéderm, Restylane, Artefill, etc., collagen stimulating fillers like Radiesse and Sculptra Aesthetic, etc. are pushed into the frontal parts of the cheeks. It is cheaper and safer than other procedures available. Fat Grafting – In this popular method, the fat from the buttocks, highs or hips of the patient is liposuctioned, processed and then transferred to the cheeks for giving a plumper and fuller effect. It gives a natural look with long-term results. People, who want to get rid of flat undefined cheeks with considerable hollows in them, should be considered as ideal candidates for this procedure. If you have under eye puffiness or fine lines around your sagging cheeks, this method is also for you. 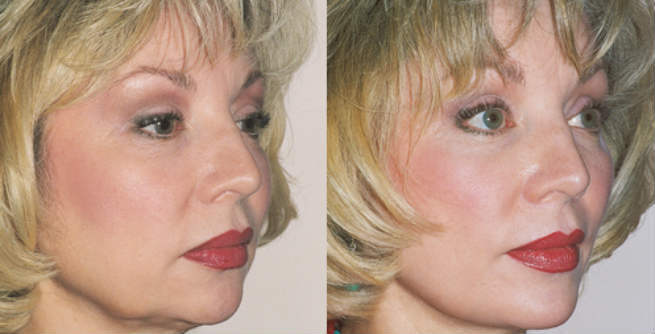 Cheek augmentation adds volume, elasticity and definition to deflated-looking cheeks so that you look more youthful. It puts emphasize to the cheeks in order to improve the overall facial appearance. Each and every cheek augmentation procedure offers long-term results. However, you may need to visit your doctor every 3 to 6 months to ensure if any touch-up is required or not. The recovery time can range between 1 day and 10 days based on the type of augmentation. There are some not-so-serious risks and side effects associated with cheek augmentation, which include swelling, bleeding, infection, blood clot, scarring, numbness, asymmetry, implant distortion, implant shifting, and so on. Gives a much younger look and that too for long-term. Adds volume to the cheeks, thereby providing a significant lift to them. Improves facial contours in order to maintain balance among various facial features. Sometimes, cheek augmentation helps in rejuvenating the skin cells too. Depending upon the type of augmentation to be performed, the cost can vary between $500 and $3,500.